Why buy 5 of these over a 25 year period? When you could buy just 1 of these? 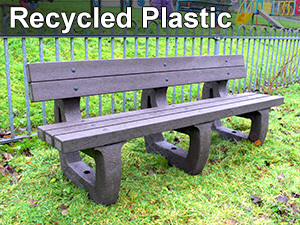 Why Buy a Recycled Plastic Bench? We use 3 types of recycled material in our benches. Recycled HDPE (High density polyethylene), Synthetic wood made from recycled polystyrene, and Mixed plastic lumber made from recycled plastic milk bottles and a variety of other waste plastics. All these recycled materials are sourced in the UK. We avoid foreign plastics as this would significantly increase its carbon footprint due to transportation into the UK from abroad. In some cases we know that recycled plastic is being shipped out from the UK and shipped back again as recycled material which doubles the carbon emissions from transportation. Not our idea of green and defeats the purpose of recycling it in the first place. Let's start with the synthetic wood made from recycled polystyrene. This is the white spongy stuff that you see in supermarkets used for meat or fish packaging, or used for coffee cups at fast food outlets and packaging of electrical goods. To make your bench, this material gets chipped and heated and mixed with colour pigments before being extruded and compressed to the same density as a South American hardwood. In fact it exhibits many of the same properties as a hardwood. It has the look and feel of wood, and can be screwed, glued and sawn just the same as wood. Our designer was delighted with its authentic wood-like finish, which can be produced in any colour. Because the colour is added during manufacture it will never need a lick of paint. It will never flake or crack, and is UV resistant to keep its colour even under frequent periods of direct sunshine - not that we get a lot of that in the UK. 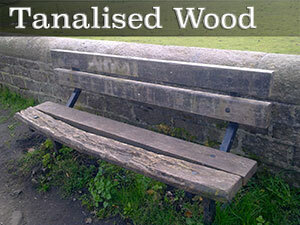 We've had a cold winter and can expect more to come, and nationwide, wooden benches have taken quite a battering, swelling up, warping, showing cracks and losing paint and varnish due to frost damage. Our recycled plastic bench does not absorb any moisture at all, so there is no frost damage possible. This is a truly maintenance free product. You can wipe off the rain and sit down immediately without getting a damp, cold backside. The Kedel recycled plastic wood 3 seater bench is made to last and to be a serious rival to the cheaper wooden varieties sold in large numbers every spring and summer. In a year those wooden benches will be looking their age, while Kedel's plastic bench will look as good as new, even after several years of use. We expect it to last a lifetime with no serious degrading of its quality looks. People tell us that this material looks even more like wood after prolonged exposure to the elements and their friends can't tell the difference. We recently had a customer complain that one of our products had a wooden base instead of a recycled plastic one. This was terrific news, as we had actually sent them a base made from this wonderful wood-like material. We believe recycled plastic lumber benches will become the norm, saving our hardwood forests, keeping plastic out of a landfill, reducing mankind's carbon footprint, while providing a beautiful, useful, maintenance-free product with all the advantages of plastic whilst retaining all the aesthetics of wood. Our mixed plastic benches are extremely robust structures in addition to their maintenance-free qualities. This recycled plastic lumber is made from plastic bags, milk bottles and all the usual plastic items you see thrown away every day by UK households. It is difficult to get this material in colours other than black and brown. In fact even the brown costs more to make which is why we have to charge a little bit more for our brown mixed plastic lumber and anything made from it. The reason for this is that when you mix many different colours of plastic together you get a fairly muddy black result. So, black is easy to produce. Brown requires quite a lot more added colour pigment, but not as much as needed for other colours like green, yellow, blue or red. If the plastic is separated into different colours at an early stage the job is much easier, but of course that requires quite a lot of manpower and hence costs considerably more to manufacture. Worldwide, mankind is only recycling about 7% of the plastic we throw away. 30% of landfill is made up of plastic. So there is plenty of room for improvement, and there is even talk of one day mining plastic from old landfill sites when the oil runs out. Much better to save it from ending up there in the first place, especially when we can do such wonderful things with it if we use a bit of creativity and intelligence. 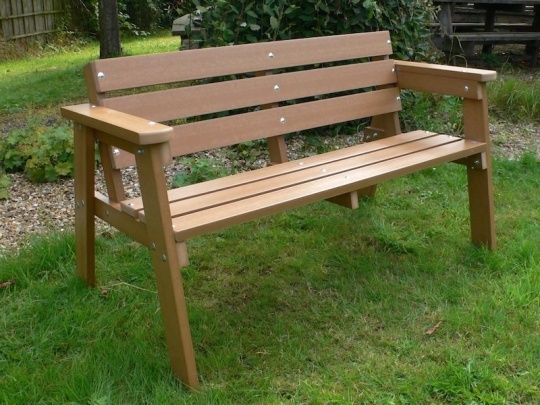 If you buy one of our recycled plastic wood or mixed plastic benches you will be helping to keep the world a greener, safer place, reducing the impact of man on climatic change, and setting a good example to your neighbours. We look forward to receiving your order and making the world a better place for future generations.